Qatar is a small country located between Saudi Arabia and the Persian Gulf. It has an area of 11,437 square kilometers, which is roughly the size of the state of Connecticut. Qatar is a relatively flat country with its highest point reaching just over 300 feet. The majority of the land is barren desert. The country has an arid climate with mild winters and very hot, humid summers. Since most of the land is desert, Qatar suffers from a lack of arable land. There are limited sources of fresh water, so Qatar is increasingly dependent on desalination facilities. The dry land also contributes to an increased likelihood of dust and sandstorms. Located within the boundaries of several successive historical empires and dynasties, the area that now constitutes the State of Qatar was a crossroads of major trade routes, including that of the Greco-Roman empires, for many centuries. Goods from the Bronze Age travelled through the region. This opportune position as a trading outpost brought a mixture of people, cultures and ideas to the area. During the 7th century, the people of modern day Qatar converted to Islam. The area was under the control of a series of Islamic empires for the next few centuries. The Abbasids and Umayyads, for example, strengthened the economy through trade and began diving for pearls. When the Portuguese conquered the area in 1521, they continued the pearl industry. The Ottoman Turks conquered Qatar as they were moving through the Middle East, but left by 1670. 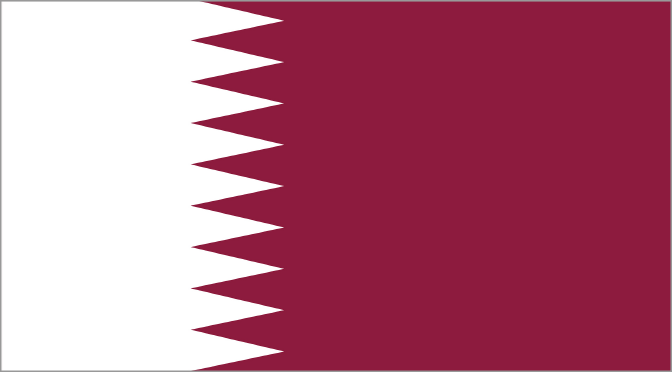 The Bani Khalid tribe held jurisdiction over Qatar from 1670 until the Al Khalifa family of Kuwait migrated to the area and claimed Bahrain and Qatar in 1780. The British entered the mix in 1821 to protect trade routes when they suspected the area to be a haven for pirates; the British subsequently destroyed the coast of Qatar. The Bahrainis laid claim to the land and ruled during the 1830s and onward. The relationship between Bahrain and Qatar became increasingly tense and erupted into several attacks by Bahrain on Qatar. In 1867 Bahrain attacked Doha and Al Wakra, which resulted in a major sea battle and a significant loss of life. In 1868, the British negotiated a treaty between the Bahrain government and the Qataris that terminated the Bahraini claim over the land in exchange for payment of tribute on a yearly basis. The Al Thani family was thereafter recognized by the British for the first time as a semi-independent political unit in Qatar. In 1878, Sheikh Jassim bin Mohammed Al Thani became the first emir of the State of Qatar and the family has been in power ever since. Qatar became a protectorate between 1916 and 1971. The British began pulling out of the Gulf region in 1968 and Qatar was for a short time in a federation with Bahrain and the United Arab Emirates. In 1971, Qatar officially became an independent state. The Al Thani family, which had been the nominal leader of the country for over a century, officially took over governance when the British departed. Turmoil in the family has resulted in several coups since that time. In 1972, Khalifa bin Hamad Al Thani seized power from his cousin, Ahmad bin Ali Al Thani. In 1974, the Qatar General Petroleum Corporation took control of all oil operations in the country, increasing its wealth substantially. In 1995, Hamad bin Khalifa Al Thani seized power from his father, Khalifa bin Hamad Al Thani, during another time of discord within the family. Capitalizing on the country’s underutilized oil revenue, Sheikh Hamad liberalized the country socially and politically, adopted a new constitution, and took dramatic measures to modernize the small country over a short period of time. Sheikh Hamid and his wife transformed the country through major educational and developmental initiatives which continue today through their internationally recognized Qatar Foundation, which is discussed further below. Sheikh Hamad was succeeded by his 4th oldest son, Emir Sheikh Tamim bin Hamad Al Thani, in 2013 at the age of 33. The youthful Emir of Qatar and his family are known for their extensive investment in London where they allegedly own more real estate than the British Crown. Qatar remains a hereditary monarchy but does have a prime minister (Hamad ibn Jaber Al Thani) and consultative assembly; these are primarily symbolic since the emir, who appoints all positions, has ultimate authority on any legislation. 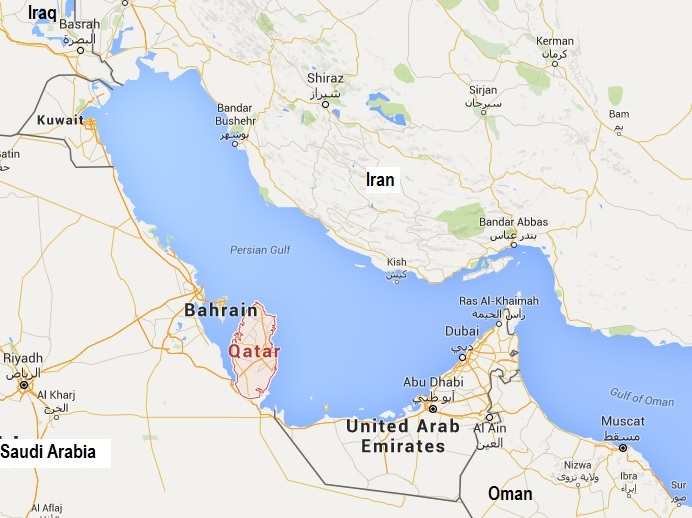 The United States’ largest military base in the Middle East is located in Qatar. The U.S.-Qatar military relationship is extremely important. Qatar provides the U.S. military exceptional access to two major Qatari military installations, Al Udaid Air Base and Camp As-Saliyeh – perhaps CENTCOM’s most important operating installations outside of Iraq. Qatar charges no rent. As of 2017, some 10,000 US troops were stationed at the Al Udeid Air Base. These bases are integral to the ongoing fight against the Islamic State in Iraq and Syria. . Qatar has provided assistance in U.S.-led airstrikes on militant Islamist forces in Iraq and Syria. Though Qatar was generally unaffected by the Arab Spring revolts, there have been calls for reform, greater transparency, and fewer restrictions on civil society. Insulated by its wealth and development initiatives, the country, nonetheless, limits free expression as well as political, trade, and non-governmental associations. Qatar has received criticism for its treatment of migrant workers. The issue has gained prominence in international media due to a proliferation of human rights violations associated with the country hosting the Qatar 2022 FIFA World Cup. Migrant labor has been used to construct the necessary facilities and infrastructure; accusations of non-payment, seizing of legal documents, and unsanitary housing conditions have plagued the project, and there have been multiple reports of worker deaths due to unsafe work environments, especially related to the country’s high summer temperatures. The State of Qatar has stated it is committed to workers’ rights and that it is the contractors responsible for carrying out the work who have committed the violations. In March 2014, Saudi Arabia, Bahrain and UAE withdrew their ambassadors from Doha for violating the GCC principle against interfering in members’ domestic affairs. That rift was resolved in November that year when emir (leader) Sheikh Tamim bin Hamad Al Thani gave in to a number of demands, including the departure of several Egyptian Muslim Brotherhood members along with dissidents from the UAE. Furthermore, Qatar closed the Al Jazeera Egypt bureau and agreed to greater intelligence and policing cooperation with GCC states. Previously, Saudi Arabia withdrew its ambassador from Qatar for 5 years in 2002 citing Al Jazeera coverage. GCC-Qatar relations remained tense, but normalized, up until May 2017. when Qatari social media and news sites attributed to the country’s emir, Sheikh Tamim bin Hamad Al Thani, quotes praising the Islamist organization, Hamas, and calling Iran an “Islamic power.” The Washington Post reported that, “citing the emir’s reported comments, the Saudis, the UAE, Bahrain and Egypt immediately banned all Qatari media.” In June, the bloc cut off all economic and diplomatic ties with tiny Qatar, and expelled all Qatari nationals from their countries in response to the country’s alleged funding and support of non-state Islamist terrorist actors who threatened the stability of the Middle East. Furthermore, the countries suspended air, land, and sea travel to and from the country. At the time, U.S. Secretary of State Rex Tillerson warned that the rift could undermine U.S. counter-terrorism efforts against the Islamic State. His attempt to remain neutral in the dispute has been challenged by President Trump’s open support for the anti-Qatar bloc. The emir denied having made the comments and blamed hackers. An investigation by U.S. intelligence officials uncovered that the United Arab Emirates had orchestrated the hacking of Qatari state media sites in order to post the incendiary false quotes attributed to the emir that resulted in the embargo. UAE leadership rejected the findings. In April, prior to the false attribution, Qatar was widely pilloried for facilitating the exchange of a group of Qatari hostages that included members of the royal family with Islamist terrorist groups in Iraq. Rather than working through official diplomatic channels with Baghdad, Qatar was alleged to have negotiated directly with militia leaders and secured the hostages’ release through a payment of $500 million dollars to Iran, Hezbollah and other Shiite groups who support Syrian dictator Bashar al-Assad. Qatar denied trying to pay ransom money to secure the release of the 26 Qataris but the saga brought attention to and reignited resentment of Qatar’s unorthodox foreign policy. Qatar sits on significant valuable natural gas reserves, as opposed to Saudi Arabia’s oil resources, which has allowed it to pursue an independent path financially and politically. This path has been pursued since the 1990s when the former emir stepped up the country’s exports of liquefied natural gas. One author notes that “Qatar generates four times more export revenue from natural gas than it does from oil, and doesn’t need to follow Saudi’s dictates the way it would if its survival were predicated on it.” Qatar shares these resources, primarily via gas fields located in the Persian Gulf — and is generally on good terms — with Iran, Saudi Arabia’s premier rival. Qatar’s apparent disregard of gulf protocol is a persistent irritant to the region’s elites. Qatar is a member of the Gulf Cooperation Council, a regional, intergovernmental political and economic union established in 1981 consisting of all Arab states of the Persian Gulf, except for Iraq. Qatar has regularly been accused of engaging in activities and supporting policies that have caused tension with the other GCC member states. Much of this stems from Qatar’s tendency of welcoming members of religious opposition groups. Historically, in an attempt to distinguish itself from powerful neighbor Saudi Arabia, Qatar used its wealth and power to give refuge to foreign, educated Arabs who had been ousted by their own countries. Historically, these exiles were used to help expand Qatar’s educational system and other ministries. In the 1950s onward, this educated elite was drawn from Palestinian intelligentsia refugees and from the Arab world’s premier learning center, Al Azhar University in Cairo, where the Muslim Brotherhood was a new and popular movement that wanted to counter modernism and pan-Arabism with traditional religious-based education and government. This was a threat to the trend of Egyptian nationalism and so many Egyptian Muslim Brotherhood leaders were kicked out of the country. Qatar hosted these actors while taking advantage of their knowledge and expertise in state institutions, particularly schools. Importing foreign players enabled small Qatar to play an out-sized regional role; this recruitment allowed Qatar to develop an education system independent of Saudi Arabia and enabled Qatar’s elites to play politics, supporting different pan-regional causes at different times. Because of Qatar’s largesse, a mutually beneficial partnership developed that ensured these actors would not interfere with the country’s domestic affairs. This reputation as a place of refuge for political exiles has continued to this day with Qatar seemingly tolerant of all perspectives, carving out for itself the role an open-minded and pluralistic mediator of regional conflict. Over time, Qatar has become increasingly willing to work with extremist groups that most other governments have rejected as perpetrators of terror. Qatar’s neighbors see the country’s engagement with troublesome foes like the Taliban, Al Qaeda, the Muslim Brotherhood, Tunisia’s Islamists, Iran, Hamas and others as provocative and destabilizing. Thus, the upheaval of mid-2017 should be considered within this historical context in mind. Following the June embargo on Qatar for its alleged support of terrorism and inciteful state media, Saudi Arabia, the UAE, Egypt and Bahrain presented Qatar with a list of 13 demands to be met by July 3rd in order for the embargo to end. Among its conditions the list called for the country to nearly sever ties with Iran and Turkey, cease all funding of and ties to “terrorist organizations,” and shut down the powerful Al Jazeera network completely. Qatar’s leaders condemned the requests as an assault on the country’s sovereignty and refused to buckle to external pressure. Some states, principally Turkey and Iran, have come to Qatar’s aid by contributing goods and services usually provided by its neighbors. Other countries including the Kuwait and the United States have offered to mediate the conflict. While the anti-Qatar bloc eased up on some of its demands, Qatar shows no sign of compromising its policies and pursuits. One report stated that “Saudi Arabia and the UAE particularly view Qatar’s support for Muslim Brotherhood affiliates as lethally threatening to their own regimes.” In 2013, when Egypt outlawed the Muslim Brotherhood, for example, Qatar stepped in to harbor its ousted leaders. Qatar also hosts the leadership of Hamas which is considered the Palestinian branch of the Muslim Brotherhood and administers the Gaza Strip. Hamas is seen as being an impediment to peace talks between the Arabs and the Israelis. Another point of contention is Qatar’s state media apparatus. Most notable is outspoken Al Jazeera but it is not the only network. Al Jazeera is known for giving airtime to controversial subjects and speakers. It has regularly covered Muslim Brotherhood officials and events. Al Jazeera was seen as supporting the Arab Spring uprisings through its extensive media coverage, much to the consternation of leaders determined to quash the rebellions. The resolution of the diplomatic crisis remains uncertain. Qatar could leave or be kicked out of the GCC. The chances are slim that the country will acquiesce to the bloc’s demands to step in line with the status quo; Qatar has powerful allies and a list of valuable assets on its side. On the other hand, Saudi Arabia is the indisputable powerhouse of the Gulf States with influential partners and an emboldened leadership. Non-Arab and non-state actors also have a role to play but to what extent they will do so is unpredictable. Each side has the resources, determination, and power to sustain the conflict indefinitely. Nonetheless, economic implications of this crisis are already being felt by Qatar, and many expect that the situation will alter regional power balances for the future. Qatar has the highest GDP per capita in the world. The country is the largest exporter of liquefied natural gas (LNG) in the world, and the country’s exports of LNG, crude oil, and petroleum products provide a significant portion of government revenues. According to the Qatar National Bank (QNB), Qatar’s earnings from its hydrocarbon sector accounted for 49% of the country’s total government revenues in 2014, a figure that declined over the previous four years. The decrease in revenue is due, in no small part, to the economic diversification efforts of Qatari leadership. The ruling family has been heavily involved in national development projects in an attempt to move toward a knowledge-based economy and reduce its dependence on fossil fuels. This intelligent investment into its human capital has since become a trend across several Gulf States. During his reign, in 1995, former Emir Sheikh Hamad bin Khalifa Al Thani and his 2nd wife, Sheikha Moza bint Nasser, founded the Qatar Foundation. In addition to private funding, the chartered, non-profit organization is government-supported and in some ways government-funded. The foundation has invited a number of international universities to establish campuses in Qatar as part of its goal to develop a youth population with the necessary expertise to maintain that economy. Its main science and research agenda is developing Qatar’s technological capacity by researching new technologies which can be successfully commercialized. In addition to diversifying the economy, this strategy also helps satisfy Qatar’s aim of becoming a research and development hub. The foundation’s social development programs aim to preserve Qatar’s culture, to “foster a progressive society”, and to confront pressing social issues. In addition, Qatar Foundation International has allowed the initiative to extend its reach beyond Qatar’s borders in an attempt to improve cross-cultural understanding through such projects as Arabic language instruction in American schools. Qatar Foundation’s initiatives to use education to promote innovation, creativity, acquisition of knowledge and expertise, and the practice of responsibility were launched in part to confront the effects of the country’s rapid industrialization and increase in revenue. Before the discovery of oil, Qatar’s economy depended on fishing and pearl diving. In 1980, Qatar was a country of just 0.2 million people, making it one of the smallest in the world. Since then, Qatar has rapidly changed, with the current population over 2.3 million. A Guardian profile of the country’s demographics noted that the population growth is due in large part to the migrant population employed in service and manual labor positions. As of 2016, immigrants made up 94% of Qatar’s workforce, and 70% of its total population. Like the other oil-rich countries in the Arabian Gulf, there are certain jobs Qataris simply won’t do, and a finite amount of work exist in traditional industries. Evolving to a knowledge-based economy is vital to meeting the development challenges and opportunities confronting Qatar’s youth. These and other efforts to deliberately shape the development of Qatar and its citizens are part of the Qatar National Vision 2030 mandate overseen by the Qatar General Secretariat for Development Planning. The population 0f Qatar is 2,194,817 (2015 est). Those of Arab descent make up only a small percentage of the national population; in fact, non-Arab expatriates make up the majority of the population with large numbers of Indians, Pakistanis, Filipinos, Nepalese, and Iranians, among others, represented. This is partly a reflection of Qatar’s location as a historical crossroads and trade route stopping point. While many of those who are not of Arab descent are foreign workers, some are citizens of Qatar and can trace their Qatari heritage back several generations. 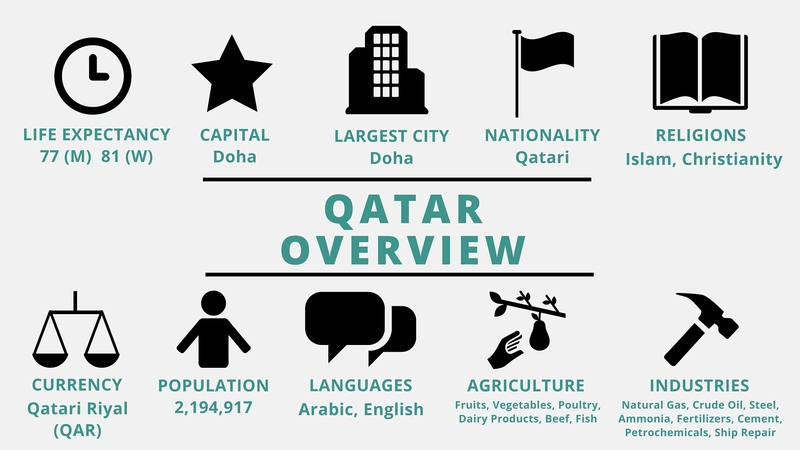 Arabic is the official language of Qatar; however, English is also used frequently, especially in schools and in businesses. Non-Arab ethnic communities are likely to utilize their respective languages. 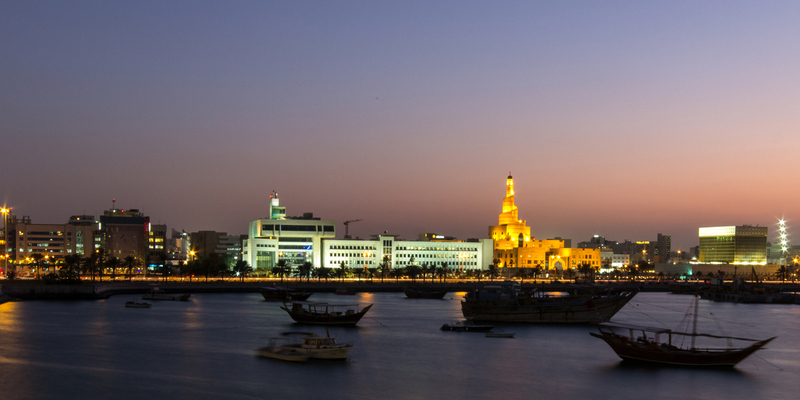 Most Qataris live in the cities and along the coast where the climate is more moderate. Qatar has a free education system. Children have the opportunity to attend kindergarten through high school free of charge. In addition to the public school system, there are also private schools to which parents can choose to send their children. The school system is run by the Ministry of Education and the Supreme Education Council. In recent years, the Supreme Education Council has attempted to improve and reform the system through the “Education for a New Era” campaign. There are two public universities in Qatar — the University of Qatar and CHN University Doha. Many international universities and research centers have set up satellite campuses in Qatar as part of its ambitious Education City initiative. The rise of satellite campuses has happened in the last 10 years and is becoming a popular choice among Qatari students. In addition to a free education system, Qatar also has a free healthcare system. The first hospital opened in 1957 and major improvements have been made to the systems since that time. Qatar’s medical expertise is on par with the United States and Europe, with the exception of highly specialized areas. Qatar is also a regional leader in preventive health care services. "In Qatar’s Education City, U.S. Colleges Are Building An Academic Oasis"
Just like many other countries in the region, Islam is the official religion of Qatar. The majority of the population is Sunni; however, there is also a small population of Shia Muslims. A variety of holidays are observed in Qatar, but the most popular are the religious ones: Eid al Adha and Eid al Fitr. There are also significant numbers of Christians, Hindus, Buddhists and Baha’is who are allowed to practice their religion as long as they follow the laws of Qatar and they dress modestly. Those adhering to other faiths are also not allowed to proselytize and they may face some restrictions on public worship. The cultural hub of Qatar is in Doha, its capital. Qatar has a unique culture that has been influenced by the multitude of societies and people that have passed through on trade routes, as well as by the high number of foreign workers residing within its borders. Food, art and music have been influenced by India and Iran, while clothing and behavioral customs are still strongly linked to Islam. Qataris enjoy typical Middle Eastern food and desserts, like hummus, falafel, and knafeh. However, because of the integration of various cultures in Qatari society, many unique dishes have emerged. A rice dish with spices, vegetables, and meat–called machboos or kabsa–resembles the Indian biriyani. Harees, which has a consistency similar to porridge, is a dish comprised of wheat (boiled, cracked, or coarsely-ground) and meat, is often eaten during Ramadan. For various other iconic Qatari treats, read more here. Although traditional, modest dress remains the widespread clothing–thobes for men and abayas for women–the fashion and design industry has thrived in Qatar for awhile, and fashion-forward dress is popular particularly among youth. In 1998, Virginia Commonwealth University School of the Arts opened a branch in Qatar, where fashion design has thrived and youth have been inspired to enter the creative industry since. To read more about the design students at VCUQ in 2017, read more here. Beyond responsible development, Sheikh Hamid sought to make Qatar prominent in other sectors during his leadership, including the media. Al-Jazeera, sponsored by the Emir of Qatar, first broadcast on November 1, 1996, as one of several Arabic-language channels that emerged after BBC stopped broadcasting in the region due to Saudi censorship. It was very small at first, but grew in popularity due to its broad coverage of Middle Eastern issues and groups, on-the-ground reporting in the 1998 bombing of Iraq (also known as Operation Desert Fox) and especially its footage of the 2003 Iraq War—Western news stations bought footage from Al-Jazeera for as much as $250,000. It has drawn criticism from some who say it is biased in favor of the Qatari government, due to it being state-funded. Conversely, throughout the Arab world, it has come under fire for presenting dissident viewpoints in Algeria, Egypt, Iraq and Saudi Arabia, as well as featuring Hebrew-speaking Israelis. The franchise has several serial programs, is accessible across the world, and has an extensive multi-media online presence featuring regional and global issues. The music of Qatar is highly influenced by its Bedouin and seafaring past as can be found across the Gulf states. Lyrics are typically Bedouin poetry and the music is played using Bedouin instruments such as the oud and tabl drum. Sawt and Khaliji are types of traditional Bedouin music and among the most popular types of music in Qatar. Even though it is small, Qatar has many places of interest, primarily concentrated around Doha. There are many sites of historical significance such as forts and castles as well as more recently established spectacles like various artificial islands. Qatar also offers family friendly recreational options like the Doha Zoo. Qatar has a growing tourism industry as a result of these increasing attractions; the country also issues tourist visas more liberally. Qatar has been able to develop elaborate attractions as a result of its wealth and investment, such as an indoor theme park, a replica of a traditional Arab market, the Katara Cultural Village, and the Italian-inspired Villagio Mall with its own canals and gondolas. The Doha Corniche, a waterfront promenade extending for several kilometers along Doha Bay, is also a popular destination, with remarkable views and numerous diversions to entertain and ample opportunity to walk or enjoy a gathering. Qatar has an array of activities for the outdoor enthusiast. Horse racing is a popular pastime in Qatar as it is in other Arab nations. Football (soccer) and cricket are the most popular sports. Qatar has hosted the Asian Cup and Gulf Cup multiple times; the country is slated to host the 2022 World Cup series, though concerns have been raised both about the health risks of the high summer temperatures and questionable treatment of foreign workers recruited to build the necessary infrastructure needed to execute such a major international sporting event. Water sports like boat racing and diving are popular in Qatar because of its location on the Arabian Gulf. Camel racing, falconry and cycling are also enjoyed. News about Qatar, including commentary and archival articles published in The New York Times. List of Qatari government websites. Qatar: Background and U.S. Relations by Christopher Blanchard, 2014.